In February 2001, a ground breaking collection, Hot Diamonds, was launched into the UK market. With each design carefully considered, creating unique shapes and styles that are truly classic in their appeal. It quickly established itself as one of the UK’s most desired and iconic jewellery brands. 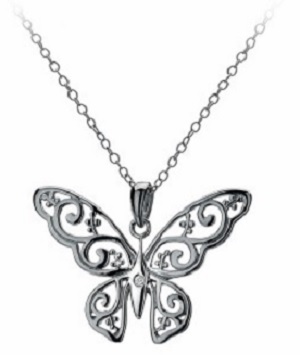 Celebrate the new you with our Butterfly Pendant. Exquisitely crafted in sterling silver and adorned with a diamond. Ornate and truly beautiful. All Hot Diamonds Sterling Silver jewelry is Rhodium-plated for longevity. It also comes with a Certificate of Authenticity. This piece, as with all of our pieces, is guaranteed 100% authentic as described or your money back. Shipping and handling is $15 within the 48 continental United States. An additional fee of $20.00 will apply for delivery to Hawaii, Alaska, Puerto Rico and Canada. We will be unable to accommodate deliveries to any other international destinations.